Salt is a chemical compound made up of sodium and chloride. It's used to preserve and flavour foods and is the main source of sodium in our diet. A small amount of salt is important for good health because the sodium it contains controls many of our bodily functions. But too much salt is bad for you and most New Zealanders eat more than they need. It's the sodium in salt that can be bad for your health. Too much sodium can lead to high blood pressure (hypertension). High blood pressure increases your risk of stroke, heart attack and kidney failure. It can also cause ankle swelling and excessive fluid in the body in some people. You shouldn't have more than 2300 mg of sodium per day. That's 6 g salt – just over a teaspoon of fine salt. For good health, you only need 460 to 920 mg of sodium a day – less than half a teaspoon of fine salt. Much of the sodium we eat is hidden, with as much as 75% coming from processed and packaged foods. The salt you add during cooking and at the table isn't the main problem as it only provides about 15% of the sodium we eat. The remaining 10% is in fresh fruit and vegetables, milk, fresh fish, chicken, meat and eggs. Avoid foods high in sodium – see the list below. Check the nutrition information panel on processed packaged foods. Salt is listed as sodium. Low-salt foods have less that 120 mg of sodium per 100 g of food. Moderate-salt foods have 120 to 600 mg of sodium per 100 g. High-salt foods have more than 600 mg of sodium per 100 g.
Use less salt in cooking – you don't have to drop all salt from your cooking but try to only add a pinch at a time. 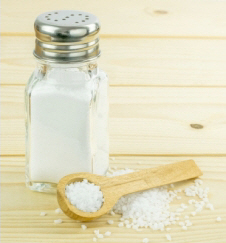 Remove the salt shaker from the table – if you find this too difficult straight away, taste food before adding salt. Try to add less and less salt each time. Salt, including rock salt, sea salt, pink Himalayan salt, and herb or flavoured salts (such as celery salt, garlic salt, and Tuscan seasoning). Anchovies, olives and pickled vegetables. Vegemite, Marmite, Promite and peanut butter. Soy sauce, tamari, oyster and fish sauces, stock cubes and powders, and gravy powders. Smoked, canned in brine, cured and salted meats and fish. These include smoked salmon, bacon, corned beef, salami, sausages, ham, luncheon sausage and meat pies. Fish or vegetables canned in brine. Salted snacks such as potato crisps, savoury crackers, nuts and popcorn. Cheese spreads and hard cheeses, especially feta, Parmesan, blue vein and Gouda. Canned, packet and instant soups, instant noodles sachets and prepared pasta sauces. Commercial mayonnaise and salad dressing. Takeaway foods, most fast foods, restaurant meals and frozen meals. Try using ground pepper, lemon juice, vinegar, fresh garlic, ginger, mustard, chilli or other herbs and spices to flavour your food. Steam, microwave or cook vegetables in a small amount of water to keep their taste and vitamins. Be careful with salt substitutes. Many contain potassium. Too much potassium can be harmful if you have kidney disease or if you're taking medications for high blood pressure or heart failure. Iodine is an essential mineral that your thyroid needs to work properly. It also affects both physical and mental development. New Zealand soils lack iodine, so iodine has been added to table salt in New Zealand since the 1920s. But many New Zealanders are now getting less iodine. Part of the problem is that processed foods usually contain non-iodised salt. Many people also use gourmet sea salt and other salts that aren't iodised. So, when you use salt at home, always use iodised salt. To help us get more iodine, food manufacturers must now use iodised salt when making bread. Another good source of iodine is seafood. A glass salt shaker image courtesy of Mister GC at FreeDigitalPhotos.net.